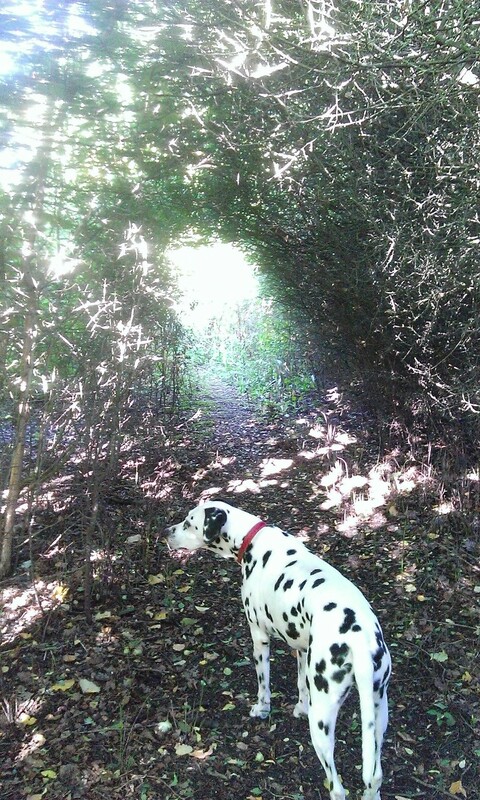 Just another temporary space/time travel portal opening up in the enchanted woods where I take Rupert for exercise. Much too dangerous to walk through and I simply change direction. On this occasion, Rupert was tempted to jump into it. He’s turning his head to one side because I’m presenting him with a reasoned argument why he should avoid doing that at all costs.The chance that he’ll emerge into a world ruled by canines who lord it over human type people is very remote indeed. Much more likely it will be a hostile environment not conducive to his doggy psyche or comparable to the standard of living he takes for granted in this world. I said I would give him a top class dog’s dinner when we got home. He turned around on the spot. So easily convinced. So trusting. So credulous. That’s a dog for you! I went for a 10 mile run on Sunday in preparation for the Grunty Fen half marathon on September 19. This went OK. I passed a number of runners who decided not to acknowledge me. Bad karma, man! I wasn’t wearing my Cloak of Invisibility. I ran humbly. I was ego-less. Yet they passed without even a cursory nod. This is on a par with the anglers who never offer, or look for, a greeting. I ran with a water bottle in a holster belt. This is a bit of a pain because it’s awkward and heavy but allows me to have two good drinks if I run 10 or 13 miles. I no longer get the excruciating cramp that I suffered in the past and I think that’s due to drinking more consistently. Club running night last night. I chose to do 4 x 1 mile. This also went OK. May go for a 2 mile run tomorrow and do Cambridge parkrun on Saturday. The death of a very well known public figure like Robin Williams or Princess Diana is always a complicated event and results in diverse responses, aided by a dependably irresponsible media. We lap up real life drama, love extreme speculation and can’t get enough cloying sentimentality. The suicide of a celebrity touches us with a degree of emotion which is absent in a statistic such as the fact that 6000+ people kill themselves annually in the UK. Are we willing to generously support children’s, animal and cancer charities? Yes, absolutely. Do we have a reasonable understanding of mental illness, psychological problems and their treatments. Would we give generously to MIND or protest that mental health is very poorly funded compared to the physical illnesses. Certainly not. Never mind. We can still enjoy the irony of one of the world’s most funny men taking his own life.